The rivalry between Georgia State and Georgia Southern has been an archetype of intra-state matchups for both schools’ students. It’s usually their competitions in football and basketball that most people tune into when the two teams play. However, one game that is often overlooked is the men’s soccer matchup. The Panthers have won the past three meetings against the Eagles, including two Sun Belt Conference tournament wins. Head coach Brett Surrency loves the series and sees Georgia Southern as a quality program. “As a competitor, it’s the type of game you want to play,” Surrency said. He has coached the Panthers through 10 games against the Eagles and owns an 8-2 record against them. In the 2016 season, Georgia State was the No. 3 seed while Georgia Southern was the No. 2 seed when they faced off in the Sun Belt tournament. As a freshman, now-senior forward Kwaku Adu-Boahene scored a game-winning goal against the Eagles. His teammate, Rashid Alarape, added another goal to snag a 2-0 win over Georgia Southern. The next tournament win, after beating Georgia Southern 3-1 in the regular season, came through courtesy of another game-winning goal by senior midfielder Max Hemmings. He was a junior when he helped secure the third straight win against the Eagles. While the rivalry series between these two has only been going on for five years, some understand the importance of beating their Sun Belt Conference rival. “The boys take great pride in beating Southern so there’s always a little extra from them in those games,” Surrency said. Some have yet to witness playing in this rivalry series but senior forward Javen Palmer has the newcomers covered when the Panthers visit Statesboro to face the Eagles this Saturday. “At times, it can be a very physical game and sometimes the ball isn’t always on the floor! But we have to prepare like we do for every game,” Palmer said. 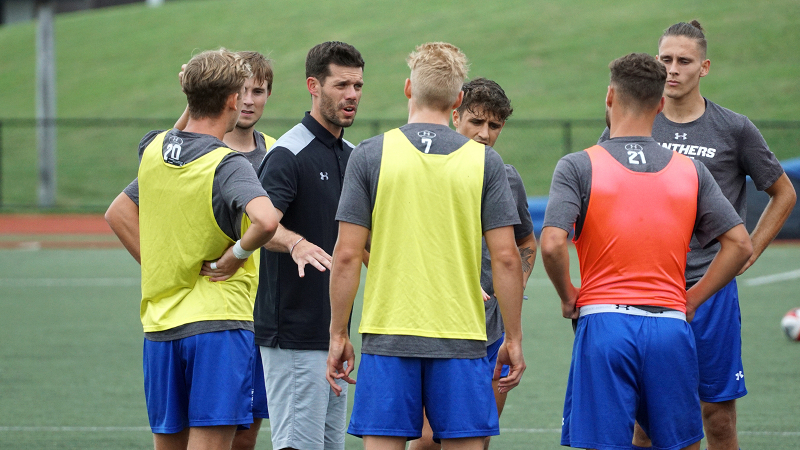 He is one of the senior transfers on this team who has faced Georgia Southern two or more times in his soccer career at Georgia State. “It’s an added bonus that we get to beat our closest rival twice in a season,” Palmer said. Georgia Southern is one of the Panthers’ last four opponents before the Sun Belt Conference tournament begins. On Oct. 20 they will play in Statesboro, where the Panthers are 3-1 dating back to 2012 when the rivalry series began.